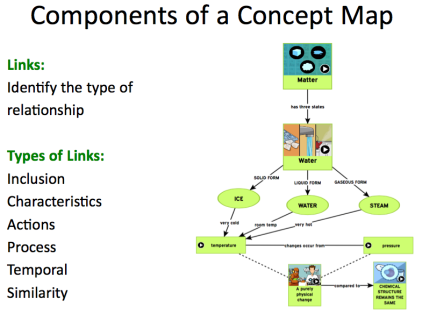 We recommend teaching students to begin their concept map creation with the Make-A-Map tool by identifying the important concepts. These are called nodes. Students may want to make nodes for the most important concepts larger than the nodes for less important concepts. The second step is to establish the relationship between these concepts. This is done by linking the concepts together. Students may need to re-order their nodes and/or re-size. Students may also want to use color-coding at this step to help organize the information visually. Students can then add to the concept map over time. As they learn new and important information, they can expand the ideas on the map. It might also be beneficial to have students watch our movie on concept mapping before they make their first map. You can provide additional support to students by creating a “skeleton map” which provides blank nodes for students to fill in (or even fill in some of the nodes yourself.) You may also want to have students focus on typing text into the concept maps first–ensuring key information is present and organized) and then adding images and video clips later.